"Ya'll have no clue what you're dealing with, do you?" After earning excellent buzz at its world premiere at the Berlin Film Festival, Warner Bros has unveiled a new trailer for Jeff Nichols' sci-fi Midnight Special. The film stars Jaeden Lieberher as a boy named Alton with special powers, on the run with his father, Michael Shannon, along with Joel Edgerton. Also starring Adam Driver, Kirsten Dunst and Sam Shepard. It's best not to say anything else, because this is a movie to go see knowing as little as possible before. I wrote a rave review from Berlin, saying the "film relies heavily on the mystery, the ambiguity of the world we live in, and how we don't/won't understand everything. But we can be awe-struck by it." Enjoy. A father (Michael Shannon) and son go on the run after learning his child possesses special powers. Jeff Nichols' Midnight Special has always been billed as more of a family film, and it has a PG-13 rating. In an interview Nichols explained the origin of the idea behind this: "I want to make a 1960's biker film. I want to make a big, PG summer blockbuster family film, kind of like I want to revamp Tremors. I've got an idea for that. That kind of movie." This is Jeff Nichols' fourth feature film, following Shotgun Stories, Take Shelter and Mud previously. Warner Bros originally had this set for release this Thanksgiving, but pushed it back until next year. 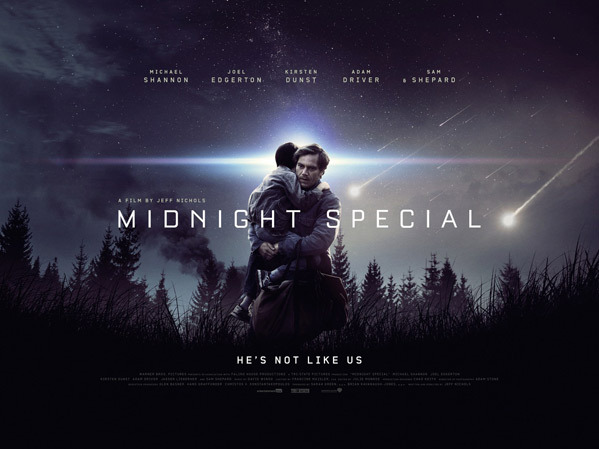 Midnight Special now opens in theaters starting March 18th, 2016 this spring. You in? What a cast!! Wow. Dunst is getting better with age! She knows her ability now. Her role on FARGO S02 was great because you hated her so much. This looks very good! High on my to watch list!